NETWORK FINALS: There were no changes from the preliminary Monday ratings. CABLE HIGHLIGHTS: It was another all-LOVE & HIP-HOP night on VH1 at 0.95/0.90/0.72, compared to last week’s 0.81/0.58/0.55. USA’s WWE telecast was at 0.91/0.90/0.85, compared to last week’s 0.92/0.91/0.83. On MTV, TEEN MOM lost 0.04 to 0.56, and LINDSAY LOHAN’S BEACH CLUB was steady at 0.21. On Bravo, VANDERPUMP RULES ticked up to 0.51, and SUMMER HOUSE was up 0.02 to 0.21. TBS’s AMERICAN DAD gained 0.04 to 0.40. Fox News’ TUCKER CARLSON TONIGHT led cable news at 0.36/0.59/3.9M, with MSNBC’s RACHEL MADDOW SHOW at 0.21/0.35/2.5M, and CNN’s CUOMO PRIME TIME at 0.16/0.20/900K. On Food Network, SPRING BAKING CHAMPIONSHIP slipped 0.02 to 0.34, and FAMILY FOOD SHOWDOWN was down 0.03 to 0.21. 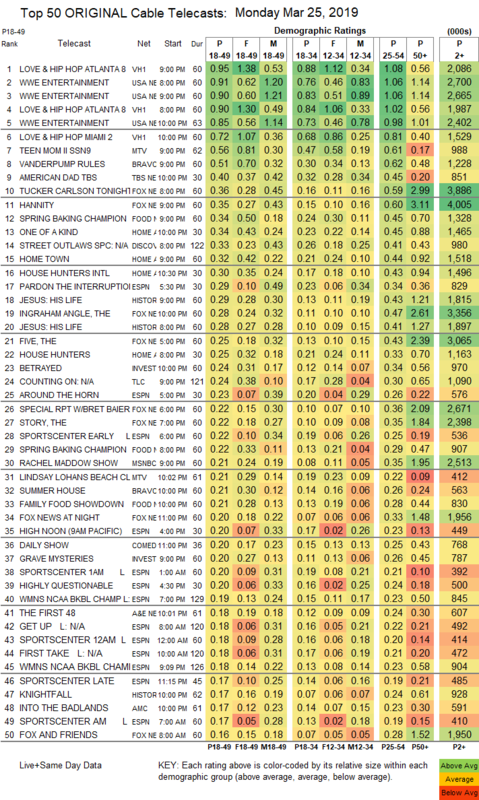 On HGTV, ONE OF A KIND was at 0.34, HOME TOWN shed 0.03 to 0.32, HOUSE HUNTERS INTL was steady at 0.30, and HOUSE HUNTERS was at 0.25, compared to last week’s 0.33/0.31. On Discovery, STREET OUTLAWS rose 0.04 to 0.33. On History, JESUS: HIS LIFE was at 0.29/0.28, and the season premiere of KNIGHTFALL was at 0.17 (down 0.18 from last year’s series premiere on a Wednesday with a VIKINGS lead-in, and down 0.03 from the season finale). On ID, BETRAYED ticked down to 0.24, and GRAVE MYSTERIES was up 0.02 to 0.20. TLC’s COUNTING ON climbed 0.04 to 0.24. On A&E, THE FIRST 48 held at 0.18. AMC’s INTO THE BADLANDS collapsed by 0.25 to 0.17 compared to Sunday’s post-WALKING DEAD episode. 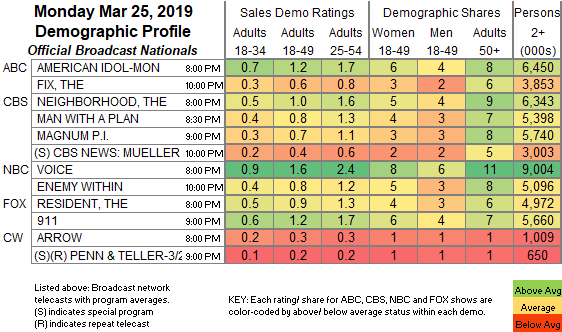 Freeform’s SHADOWHUNTERS was again steady at 0.12. Tru’s THOSE WHO CAN’T was at 0.09.